Wireless display technology is quickly becoming prevalent, even standard infrastructure for meeting rooms and classrooms across the globe. Making displays wirelessly accessible empowers the participants in a room to share information more freely and naturally, improving meeting results and productivity. In the future when we look back, we suspect the evolution of wireless display technology from our current displays will seem obvious – the same way color televisions were a natural progression from the black and white sets. But, as the adage goes, hindsight is 20-20. Right now, as we live through the adoption phase of wireless display technology, there’s a gap between previous standards – i.e. the old way of doing things – and the new technology that will shape the future. As a provider of a wireless display solution, we want to offer an overview for those that may be new to the technology – what wireless displays are, what differentiates wireless display solutions, and how wireless displays are shaping the future of meetings and collaboration at the crossroads of our digital and interpersonal lives. So what is a wireless display? A wireless display is any type of display – i.e. flat panel LED, LCD, projector, video wall, etc. – that can be accessed wirelessly from a separate device – such as a laptop, tablet or smartphone. The vast majority of the wireless display solutions available in the market operate over standard IP networks like WiFi. In other words, users join the WiFi network that the wireless display is attached to in order to connect. 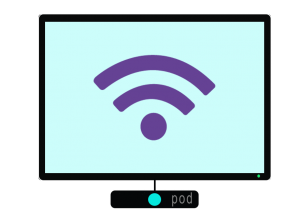 In general, today’s enterprise wireless display solutions are separate consoles or dongles that plug into existing displays to make the displays wirelessly accessible (like our Solstice Pod). At the most basic level, wireless displays enable users to share content from a device to the display without being tethered to the display by way of a video cable. If you’ve ever walked into a conference room to give a presentation, you probably had to plug an HDMI or VGA cable into your laptop in order to show your presentation up on the main screen. Wireless displays cut the cable in conference rooms, enabling users to present on the main screen wirelessly. But as we discuss in the next section, wireless displays also do much more. What differentiates wireless display solutions? Beyond cutting the cable, wireless display solutions have fewer things in common than you might guess. Each solution has a unique approach to the problem and supports different features. At the highest level, we should distinguish between consumer solutions – that primarily serve entertainment purposes – and productivity-focused, enterprise wireless display solutions employed by businesses and education institutions. Consumer solutions are primarily used for streaming entertainment content like Netflix. These solutions are generally limited to one connected user at a time, and often have limited support for the various user device platforms, such as support for Apple AND Windows devices. A couple examples of these solutions include Google Chromecast and Apple TV. Ultimately these consumer products can be great for home/consumer use but usually aren’t the best solutions for meeting rooms or classrooms. On the other hand, enterprise wireless display solutions are productivity-focused and usually support a broader range of content (like business applications, presentations, etc.) as well as a broader range of user devices (like Windows, Apple, and Android). However even within the ‘productivity-focused’ category, there is a lot of distinction and variation between solutions in terms of features and the overall approach to wireless displays. Here are a few factors that we think are the most important and distinguish our Solstice wireless display solution from the pack. Unlimited users with unlimited sharing. 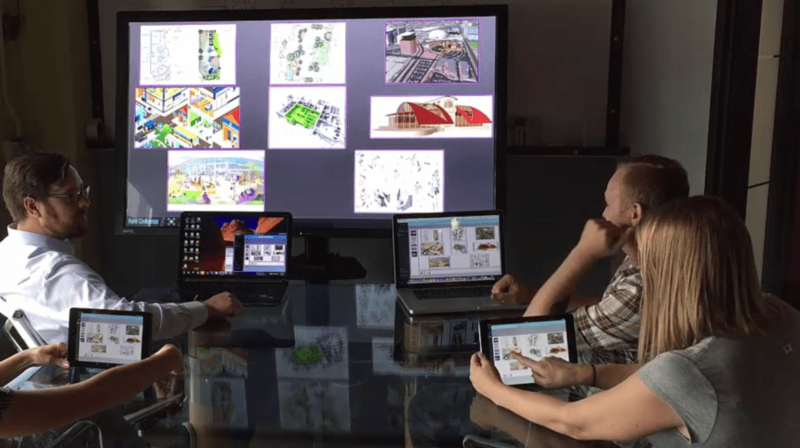 The single biggest factor that sets Solstice apart from other wireless display solutions is that Solstice supports any number of connected users sharing any amount of content on the display simultaneously. Thanks to Solstice’s unique software architecture – vs the hardware-based solutions in market – Solstice users are not locked into a single person connected and sharing or even quad view/sharing. Instead, any number of Solstice users can connect and share any amount of content at once, supporting any type of meeting – from a single-presenter session, to an auditorium full of collaborators each sharing content simultaneously. Customizable layouts and user control. In addition to supporting unlimited users and sharing, only Solstice gives connected users control of both the media content shared (e.g. any users can pause or play a video shared by another user) AND control of the layout of the content on the screen. Users can arrange, move, delete, and scale content posts to achieve the layout that best serves their particular meeting. The result is more engaged meeting participants and higher fidelity results based on user-controlled content and layouts customized for the task at hand. How (and why) wireless display technology is changing the world. Changing the world? Really? It’s a big claim, but hear us out. The emergence of wireless display technology is really a product of other technology trends and market forces colliding, and it has the potential to result in the more natural integration of our technology into our work and interpersonal lives. Mobile computing in the form of smartphones and tablets is here to stay, and the ‘Internet of things’ phenomenon is now upon us. Soon, nearly everything that isn’t already Internet-connected will be, including the appliances in our homes and the cars we drive. These two trends are driving the need for and development of wireless display technology. Spending hours per day on our smartphones and tablets has made us experts at using our personal mobile devices as information resources. So employing those devices and skills in the service of meeting-room and classrooms productivity is an easy if not natural progression. What better way to do so than to transform those existing in-room displays into network-enabled collaboration hotspots that can be easily accessed from all those laptops and mobile devices? With computers now in (nearly) every pocket, we’re moving toward a culture of perpetual engagement. As a result, the traditional broadcast paradigm of displays supporting only a one directional flow of information has become antiquated. It has been replaced by the paradigm of the wireless display that is accessible and shared by multiple people for a more interactive and engaging experience. Beyond productivity and entertainment, we see the potential for an interesting second-order effect on a social level as a result of wireless displays. Remember with the adoption of smartphones it seemed like everyone was always looking down at their phone screens instead of looking at the person right in front of them? We believe wireless display technology could bring mobile computing full circle by enabling users to naturally engage with their devices AND the person(s) in front of them at the same time via a shared wireless display. People likely aren’t going to stop using their mobile devices, even when out with one another in public. But we believe wireless display technology can expand the use of mobile devices from solely isolated, private experiences to inform and enrich our shared, social experiences as well. What exactly does the future of wireless display technology look like? Only time will tell, but here at Mersive we’re betting it’s going to change the way we meet, collaborate, and relate with one another and our devices. Welcome to a world without wires.